My husband’s grandma used to say . . . actually, she still does, “the cheaper the meal, the better it tastes”. Mac & cheese was a staple in my husband’s house while growing up. 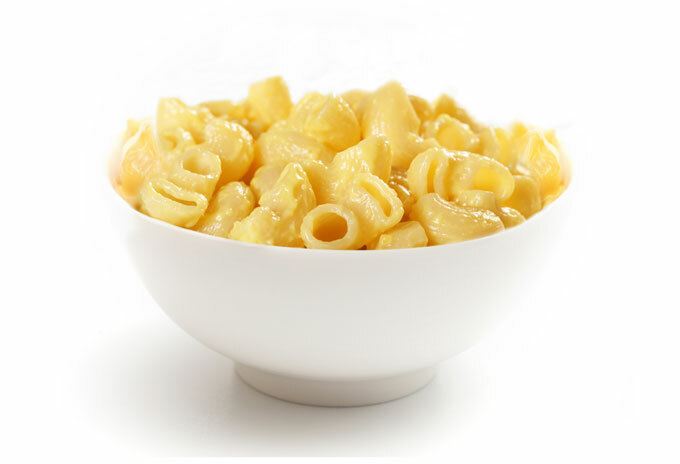 That’s not surprising since mac & cheese is also one of the most popular (if not the most popular) comfort foods known to man – or at least any North American. 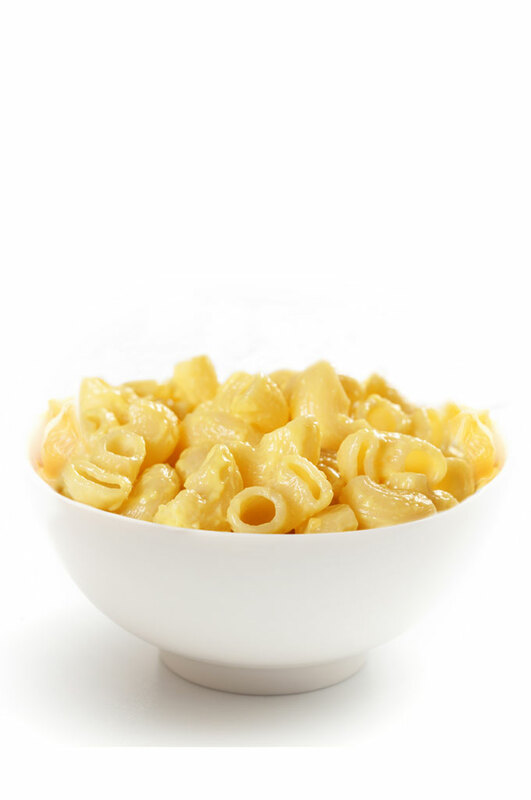 Like other dishes referred to as comfort food, mac & cheese soothes more than our taste buds. It reaches much deeper into our psyche, all the way back to our childhoods. And there’s a subtle science to why we seek it out. New research has suggested that certain foods resonate with us not just because we enjoyed them in our childhood, but because of the feelings towards the people – often our parents or grandparents – who prepared the food for us. In other words, our love for certain foods is an extension of our feelings towards certain people. Perhaps because of his childhood, my husband (Tanner) has been requesting mac & cheese for quite some time (ever since we got married, actually). So, here’s my vegan spin on this dish – it’s creamy, rich, and cheesy. The base for this vegan mac and cheese is made from yellow potatoes and carrots. If you’re a bit skeptical, trust me – this is the best vegan mac and cheese I’ve ever made. Instead of tasting potatoes and carrots, you’ll taste a lovely cheesy tang. This cheese sauce easily fools even a regular dairy consumer into thinking that this is the real thing. Even Tanner, who grew up on classic mac & cheese, prefers this version. I’ve tried several other versions – using cashews, pumpkins, squashes, and sweet potatoes – but none of them came even close to this one. This potato-carrot “cheese” is seriously life-changing. I’ve been maintaining a plant-based diet for couple of years now. Do I miss the dairy-based creamy cheese sauces? No, but only thanks to some awesome vegan ingredients that mimic the taste of rich creamy sauces really well. Cashews are probably the most poplar base for vegan cheese and creamy sauces. They are neutral in flavor, very creamy in consistency, and also soft and easy to blend. Put all of this together and you have an excellent base for plant-based creams and cheeses. The only reason I didn’t use cashews for this recipe is that they are quite heavy and high in calories. And since most people eat mac & cheese for dinner, I wanted a vegetable-based sauce. Yellow potatoes and carrots are the way to go. While sweet potatoes, pumpkins, and squashes are delicious as well, their sweet flavor simply overpowers the cheesy savory flavor of nutritional yeast. In case you’re not familiar with nutritional yeast, it’s an inactive form of yeast that provides cheesy flavor sans dairy. While nutritional yeast doesn’t taste exactly like cheese, it has the same umami flavor. The final essential ingredient is olive oil. Many dairy sauces use animal fat to enhance flavor and consistency. Olive oil is a great alternative. You don’t need much to create a thick, creamy texture that resembles dairy sauces. 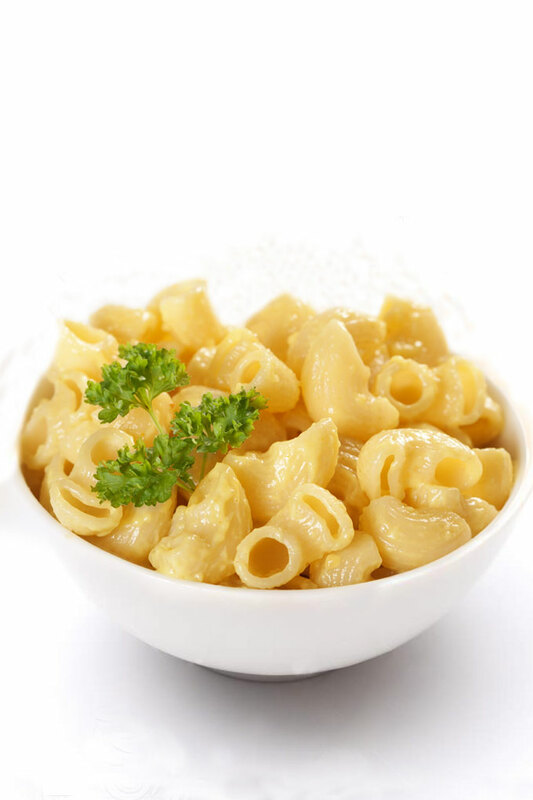 This vegan mac & cheese is one of the simplest comfort foods you can make. All you need to do is cook the root vegetables, put them into a blender together with the other ingredients for the cheese sauce and blend. Creamy, flavorful, and satisfying. Vegan mac and cheese made with potatoes, carrots, and nutritional yeast. Even a non-vegan won't be able to tell that it's not the real mac and cheese. Cook macaroni al dente according to package instructions. Drain the cooking water and set the pasta aside. Boil the potatoes and carrots for about 15 minutes, until soft. Don't discard the cooking water - you can use it for the sauce. Put all the ingredients in a blender and blend until smooth. Pour the sauce over the cooked macaroni and mix it well. Serve immediately. Store leftover mac & cheese covered in the refrigerator for 3-4 days. Reheat on a stovetop, adding extra broth if it's too dry. *10 oz (285 g) uncooked macaroni equals ~2 3/4 cups. *I used quinoa macaroni pasta. This recipe has been adapted from Veggie on a Penny. can i make this ahead and just warm it up to pour it over the pasta? Can i use sweet potatoe instead of carrots? that sounds better to me even i have never tasted this before. Have tried this and it tastes great, I would double the nutritional yeast, onion and garlic powder though. Do you think I could freeze the sauce to use for a later date? Hi Martha, I have tried freezing it! It freezes and thaws fairly well, however due to the potatoes the texture changes slightly after thawing. It becomes a tiny bit grainy maybe, but it’s very slight. If you try it out I’d love to know your opinion. Hope this helps! Ive tried it out. Its still pretty good. We made this last night. Very quick and easy and usually everything we have at home already. Those are the perfect kind of recipes. Thanks for sharing. Hubby love it too. My boyfriend and I both love this mac and cheese! I am allergic to nuts and always thought sauces made primarily from squash was too overpowering. This one is perfect, thank you so much!! HI Emma – I am so glad you found a recipe that will work for you! My husband is pretty obsessed with this mac & cheese (and he’s not even vegan) so I hope you enjoy it as well 🙂 Thank you so much for taking the time to comment – I really appreciate it. Can I use a half of a cup of cashews to make it a little cheesier or would it mess it up? I had to adjust my palate for the flavor but after adding some Italian breadcrumbs and a little bit of pepper, it wasn’t too shabby. I’ll definitely make again because my stomach doesn’t like dairy products. My daughter is allergic to cashews, so I had to comment here with a huge THANK YOU, for posting this specific recipe. I haven’t made this yet but I’m going to try it without the family knowing what the ingredients are. They are very picky as I’m preparing more vegan dishes. We are not vegan, but we are allergic to gluten, dairy, beef, pork, sugar, and chicken. I know…!!! Do you know the nutritional values/facts for this recipe? Hi Sam – sorry, I don’t have it on hand. Every time I want to figure out macros and calories, I use an app. Is there anything particular you’re looking for? I can calculate it and let you know. How many calories per serving does this contain? Hi Cara – the whole meal has 1,724 calories so one serving would be around 431 calories. (Note: I calculated the calories using regular macaroni pasta. The calories will vary depending on what type of pasta you use). I was skeptical when I saw that recipe, but I thought : “oh well, what do I have to lose. At least, I’ll know that this kind of stuff is no good.” Boy, was I pleasantly surprised. It was yummy! The only thing I did that was different was that I tripled the amount of lemon juice. I poured that sauce on top of broccoli and kale. I made this for dinner tonight and it is pretty good. It definitely looks like yummy Mac and cheese! I used canola oil because I didn’t have olive oil. I also didn’t have onion powder so I added a couple tablespoons of raw onion. It’s a bit oniony but I love onions so it’s all good. My two year old is super picky and hasn’t tried it yet. I’ll keep offering it because I think he’ll like it. He’s allergic to dairy and nuts (including coconut) so this is the only Mac and cheese he’ll be eating anytime soon. I was pleasantly surprised by this recipe and will definitely try it again. Thanks! Thanks so much for this recipe! My (adult) daughter has had food sensitivities since she was a baby. The only thing I had to change was to substitute 1/2 teaspoon each cumin and turmeric for the onion and garlic, as she can’t eat these. It also gives a nice “cheesy” color to the sauce due to the turmeric. Also, if you keep the sauce separate and freeze leftovers, you can just re-blend the thawed sauce and it gets rid of the “grainy” texture. I served it over gluten-free penne pasta. She loved it! She must have thanked me at least a dozen times, so I sent her a link to your website. Thanks again! Fab recipe. I love this Mac n Cheese, the cashew version is just too rich. I doubled nutritional yeast and spices a bit, and that last 1/2 teaspoon dash of cayenne gave it Pow! Thank you. Next time I am making Shitake Bacon to go on top. Yum. All your videos are so inspiring and Tyler’s taste testing is adorable. So happy you enjoyed the recipe Joanie! Thank you so much for the feedback ❤ I love the sound of shiitake bacon. Do you use liquid smoke for the bacon? can you tell us the nutrition facts of this meal? Hi Ohud – for sure! The entire recipe as is written has 1,700 calories. Total fat: 33.9 g, total carbs: 302 g (fiber 27.8 g), protein: 61.1 g.
I’m loving your blog since I’ve discovered your YouTube channel a couple of days ago! I have a very, very small blog where I share my own recipes, my children’s lunchboxes and healthy options. I’ll be trying your recipe in the next week and I was thinking about mixing some broccoli in the sauce…just a little bit to give it a greener touch. Do you think that will alter the texture? Love your videos and healthy lifestyle. I think I’m going to try with steamed broccoli! Just one question: for making coconut yogurt (another amazing video that I checked on YouTube!) which probiotic capsules do you recommend? I’m ordering from amazon…thank you! 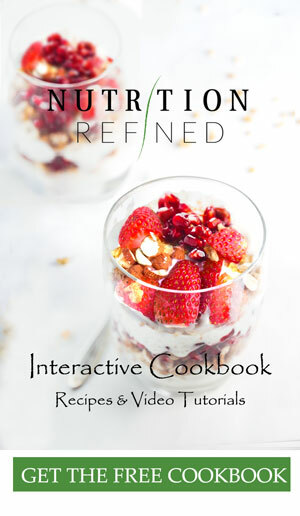 Hi Maria – if you go to the actual recipe post for the coconut yogurt (https://nutritionrefined.com/vegan-yogurt/) and scroll all the way down to the recipe ingredients, you will see a link (it is an Amazon link) to the exact probiotics I use for making yogurt. The brand is called Renew Life. Can you omit the oil? Hi Monica – yes, you can. The “cheese” sauce just won’t be as smooth and creamy. Wasn’t crazy about this when it first came off the stove. There was some flavor in there not agreeing with me. However, the next day I added freshly ground pepper, paprika, and a bit of Vegenaise. It was delicious! I will be making this again. My boyfriend (vegan/allergic to nuts) and I (allergic to most things) have made this recipe twice now, and will probably make it a million more times. It is amazing! It comes together so quickly and I appreciate how simple and healthy the ingredients are. Thank you so much!!! Okay, I made twice as much sauce as I needed ( I knew it would be good and it is). Now what to do with the leftover sauce? I am thinking a Tex Mex; zucchini, black beans, spinach, onions, shaved brussels sprouts, all sautéed with spices. Layered with tortillas and yummy leftover sauce with salsa. I think this sauce with do more than macaroni. Thank you for the inspiration.